The LTTE has cut off the water supply to over 30,000 acres of paddy lands in Seruwila threatening the livelihoods of a large farmer community. The situation has assumed grave proportions since the local population are largely dependent on this supply for drinking purposes as well according to the Chief incumbent of the Seruwavila Rajamaha Viharaya the Ven. Seruwila Saranakiththi. According reports from the area, the LTTE has shut off the sluice gates of the Mavilaru anicut which feeds large tracks of farm land. The Sri Lanka Monitoring Mission (SLMM) has confirmed the act. The Tigers have also barred irrigation engineers from entering the area to open the sluice gates. The majority population in the area are Tamils while it also has a sizable Muslim population. The Ven.Saranakiththi told the Daily News that the deprivation of water to the paddy fields during the past three days has already caused the withering away of paddy stalks which could destroy the entire harvest. The Thera said the Mavilaru anicut is the main supply source to the entire Muttur-Seruwila and Ichchalampattu District Secretariat divisions. He said the situation was grave since the people depend on this supply for drinking purposes too due to the brackish nature of the well water. 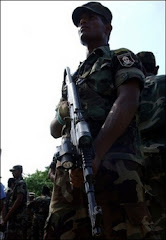 Peace Secretariat sources in Colombo say that it is ironic that the LTTE who claim themselves to be true representatives and liberators of the Tamil people were causing those very people to suffer hardship. They point out that even during fierce outbreaks of war between countries one of the unwritten laws is not to deny civilians access to water. The LTTE has also been hampering development work funded by the Government in uncleared areas. A couple of months ago LTTE cadres shot dead 12 civilians who were repairing an irrigation tank in the Gomarankadawala area and burnt down their vehicles and earthmoving equipment.